It is not a secret for anyone that casinos do not like blackjack counters and frequently ask them to leave or to play another game. Here, we will describe how casino management detects counters and how to act when caught. We also describe the countermeasures that casinos use against skilled players but most of all we show you how to count cards while not getting caught. Most casinos have strict policies that ban any player from counting cards when playing blackjack, but some like those in New Jersey do not pay any attention to such players. How Do You Know Whether A Casino Minds? You do not. But you had better act as if they all do and thus save yourself the embarressment of being shoved out if they do mind and if they catch you red-handed. How to Count Without Getting Detected? 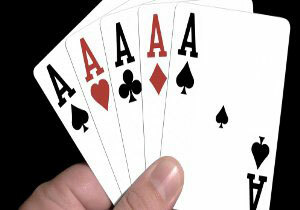 1) Do not stare at the cards of other players. Glance once, count, and then move on. 2) Do not stare at the cards that have been discarded. Look quickly and then slowly move away by shifting your gaze nonchalantly from player to player. 3) Change your pattern of betting occassionaly. 4) Change the amount of betting money each round. 5) Even though you know it, loose a round or two. Do not bet big on those rounds. But likewise do not bet too small too. If the casino notices that you are always winning big and losing small, they might get suspicious. 6) Buy chips of different colours and then mix them around while playing to confuse the dealer. 7) Talk to the other players while playing, but this is especially difficult so practice this at home before trying it at a casino. 8) Pick your seat carefully: either the first chair or the third one so that you won't have to twist your head around as the cards are dealt. 9) Dress casually because smart and elegant clothes cause the dealers to think you are intelligent and they might watch you more closely. 10) Order an alcoholic drink and pretend to sip it because they are looking for those non-drinkers who are staying sober to count the cards. The common denominator of all these is that you must never forget that the casino si watching you and how you play. Act accordingly! Supposing that the Casino Catches On, What Should you Do? Stay calm if the casino catches you counting cards and abide by their wishes quietely. Do not make a fuss. If they ask you to leave, do so. The faster you leave, the easier it will be for you to return later. Remember that if you make a fuss, they will all remember you, so desist from any unfriendly behaviour. Note that after shifts change, the new personnel won't know you so all you have to do is wait for that and then you can start playing again. You could also just enter the next casino and start earning money there instead of risking casino personnel from recognizing you.